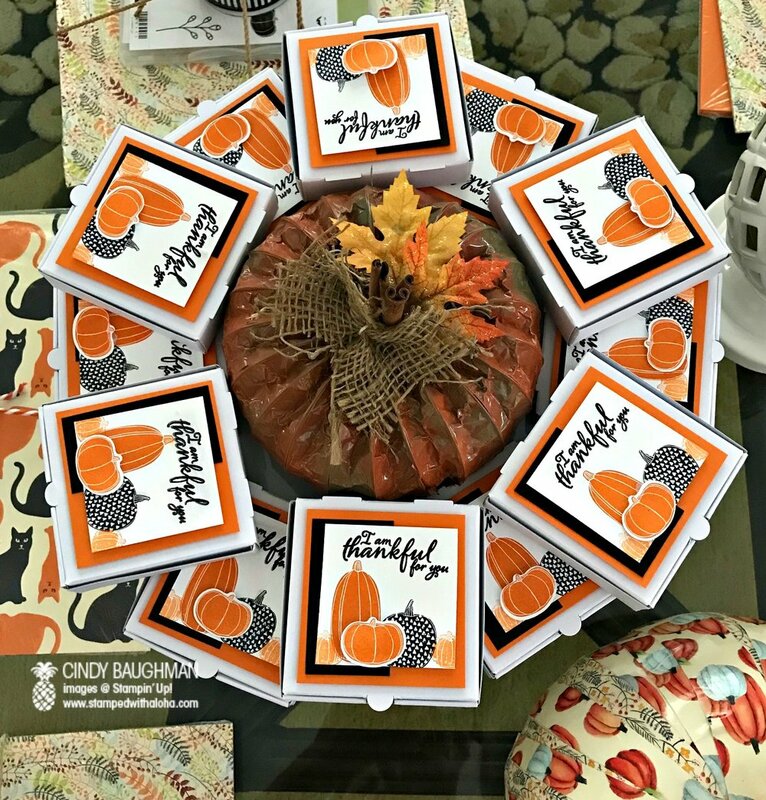 When you hear the word Paper Pumpkin you may be thinking I am referring to the awesome monthly Stampin' Up! craft kit you can subscribe to, but that's not it. 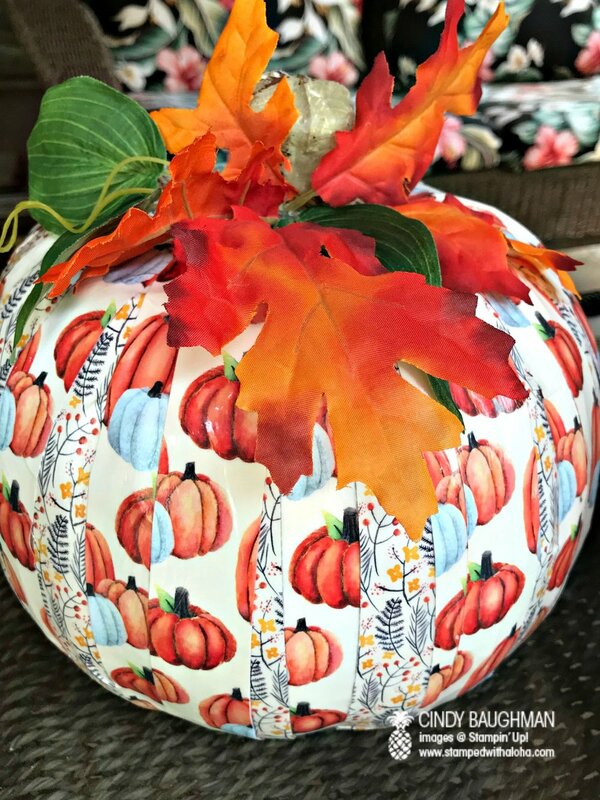 I am literally talking about a pumpkin that has been covered in strips of our beautiful Painted Autumn Stampin' Up! Designer Series Paper to create a decorative fall home decor piece. To create these fun decorative works of art I simply purchased plastic pumpkins at WalMart. I then took one and a half pieces of Designer Series Paper and cut them into strips. I then covered the strips with Mod Podge glue and adhered them to the plastic pumpkin. I used hot glue to add some leaves at the top. Since I host two separate Bunco groups each month, I made two different pumpkins. The one pictured above was the prize given at Sunday's Bunco. Stampin' Bunco is so much fun. We always have a great time. The most unique thing happened at Sunday Bunco, Lori and Bea added up their score card and they had the exact same score in everything! This has never happened before. We declared them official Bunco Twins! Something cute happened at Monday's Bunco too! Becky won the pumpkin aloha prize early in the game and as she held it close she said, "this is my baby, please don't anyone take this from me". Well as usual, the pumpkin got passed around all night until the last round when it ended up in the hands of Roxanne, Becky's daughter. When Becky saw that her daughter won she stood up and said, "I think you should give that to me because giving birth to you was really hard, and remember I said that the pumpkin was my baby, just like you?" Roxanne smiled and being the kind daughter she is she said, "Of course Mother, if you want it, you can have it". We all laughed watching this exchange and both Mother and Daughter were blessed and went home like happy campers. Monday's paper pumpkin that went home with Becky is the one below. It is pictured along with one of the cute pizza box favors that everyone got at this month's bunco. I LOVE our new pizza boxes. They are so simple to make. I really enjoyed working with this Pick a Pumpkin stamp set with coordinating framelits. It's hard to tell in this photo but I also brushed "wink of stella" over the black pumpkin and words, "I am thankful for you", to make them shimmer. I was really happy to give these favors to each of my guest because I truly am thankful for them all. We laugh, we eat, we play, we really enjoy each others company. When I told them that we may not have Bunco in December the response was moaning and groaning. I love it that these friends love to come over and spend this time with me. Who knows... maybe we'll have to find a way to have one in December after all! For our October Bunco last year, I made Paper Pumpkin Aloha Prizes too, I think I shall make this a tradition as I enjoyed making these pumpkin prizes. I am glad I had such pretty Designer Paper to work with. Did you know we are currently having a Designer Series Paper Sale? If you purchase 3 packs from the list of selected papers below, you can get one free. If you'd like to order paper or any Stampin' supplies and at the same time help a worthy cause, here is how. 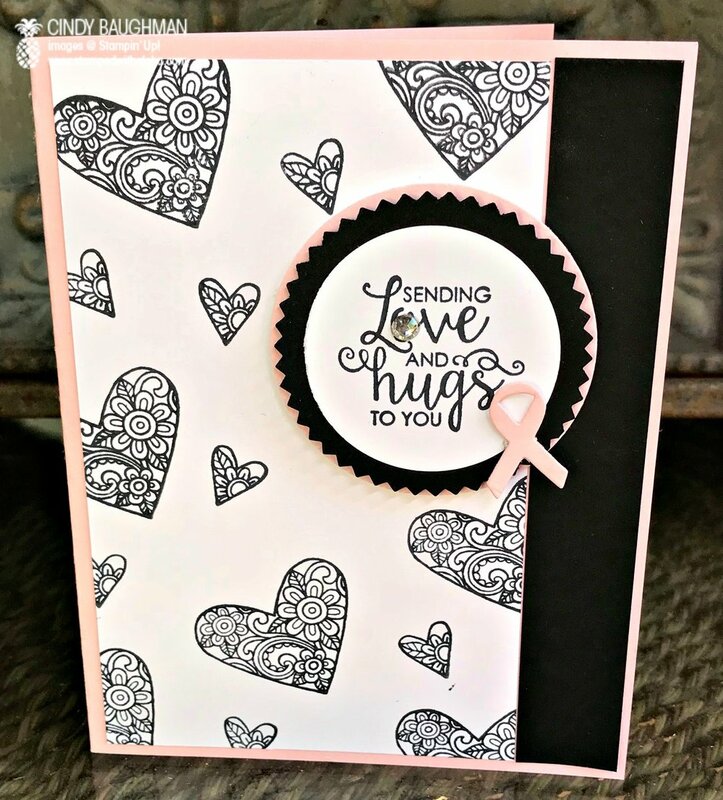 Orders of any size placed from October 10th till October 31st using Hostess Code JHJ4WEUZ will qualify for a FREE Pink With Purpose Card Kit. This Kit will include a supply list and photo of the cards plus all the cut card stock for you to create these two cute make and take cards. If your order is over $150 don't use the hostess code so that you can earn hostess rewards. If you have any questions, please email me at stampedwithaloha@gmail.com. I will be donating a portion of my commission on every order placed at our Pink With Purpose event to Hawaii's Hope Lodge. Well, I hope you enjoyed seeing some fun Fall decor ideas as well as some fun Fall favors.